Put on the teapot, or fill up the french press, whichever is your preference. Let’s take a few minutes to chat and just catch up on what has been going on lately, what do you say? I’ve been moonlighting with Ebenezer Scrooge quite a bit lately. If you’re in the Dallas area this holiday season, come on down to Pocket Sandwich Theatre for a musical re-telling of a Christmas classic in a casual dinner/theatre atmosphere. If you get an opportunity to take a class with the ever-fabulous Ysolda Teague, don’t let it pass you by! Her “Perfect Sweater” class was wonderful. Many thanks to the staff of The Woolie Ewe for hosting the “Perfect Sweater” class. The day of the class was the first time I visited this LYS, and I have already been back a second time. 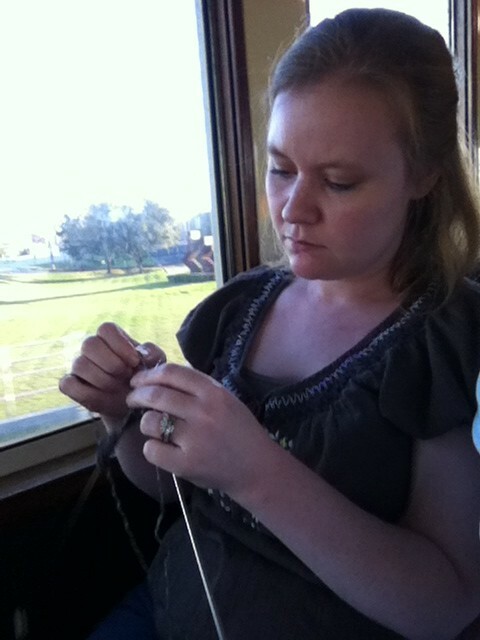 Very focused on learning short rows during our train ride. If you’re looking for something out-of-the-ordinary to do in the Dallas/Fort Worth area, why not give the Grapevine Vintage Railroad a try? Ready to tackle short rows? Check out this video from KnittingHelp.com. 11-11-11 marks the arrival of a video game for which I have been waiting years. And I’m not exaggerating. The Elder Scrolls V: Skyrim. Tease me if you must, but I am taking the day off of work on November 11 to celebrate. This game is also the inspiration for Adam’s special request knitting project. Any ideas what it might be?